Makeup has always been a weird thing for me. I'm forever conflicted between "beating my face" and keeping it all the way natural. There is nothing wrong with either choice, but I really wanted to find a way to create some balance. I've devised the perfect "natural gal" makeup routine for me, which I plan on sharing with you guys later. For now let's get into these Makeup Revolution palettes that I absolutely adore. 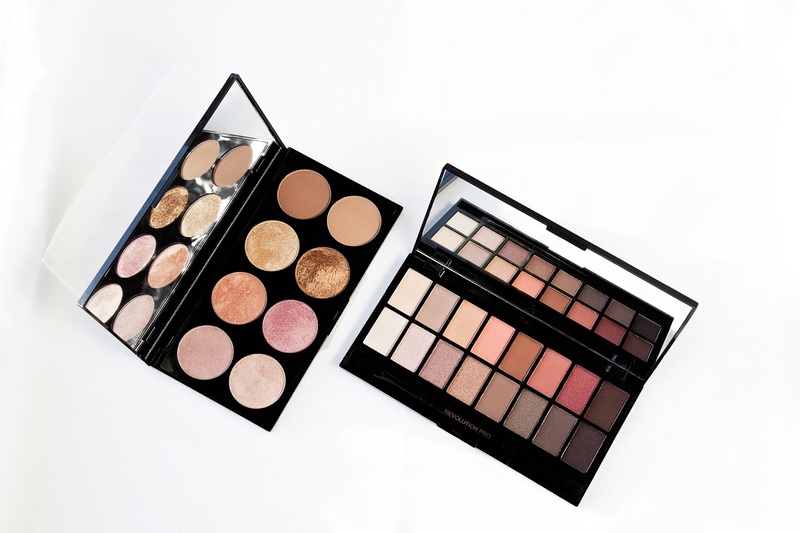 They're both easy to use, super pretty, and very affordable!! You ever just look up at the sky and wonder what life would be like if it were any color other than blue? Ever imagine yourself floating somewhere amongst the clouds or stars? Maybe filling yourself with an inner light by letting the sun shine through you, instead of on you? Or even allowing the glow from the moon to settle on your skin, creating a soft hue of something that shines? Well, that's what it's like to be a dreamer. Head in the clouds, friends with the sun. Wings spread wide to welcome the the possibility of a beautiful life. The sky seems so far away and hard to get to, but it's nearer than we think if we really want to. Anyone with confidence and a dream ought to know that. I find comfort in the sky, it is where my dreams reside. I love, love, love, love my pink leather moto jacket. It was to me, from me birthday gift back in October, and I have no regrets. I got this little lady from Zara, my favorite store. I swear y'all, I will find any excuse to put this thing on! I like to let it be the stand-out piece, since it's so bright and pink. Keep on reading to see how I created this super cute look. We are now experiencing that strange period between winter and spring. The weather is weird and inconsistent, you experience at least five different temperatures a day, and you don't know what to wear. I know how it is, but the best part about this awkward time of year, is playing with your wardrobe. This is the best time to mix and match seasons, create new looks, and get rid of some stuff if you have to. I personally love finding new ways to carry over my pieces from season to season. I took two items from my fall wardrobe, and one from my winter wardrobe to create this very simple look. I'm gonna break this outfit down for ya!